Our annual Birthday Party for the Homeless is just around the corner! You can help a hurting man or woman feel loved and remembered during a difficult and lonely time in their life. Join us for a birthday party! Watch our video above. What is Birthday Party for the Homeless? This annual event is held at our Burnside Shelter to give joy to people experiencing homelessness. Many of the people who come to us haven’t celebrated a birthday in years. We take this day to recognize them, strengthen relationships with them and offer a space with creative activities and treats. 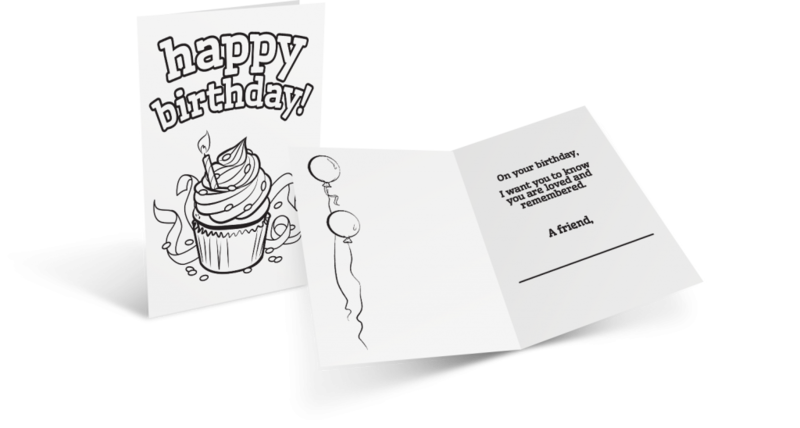 Give a birthday card to encourage someone in need. This is one of the greatest ways you can help us! Download the card below and mail it to 13207 NE Halsey Street, Portland, OR 97230. (Mail cards ASAP). Give the best gift a man or woman could ask for in their time of crisis—hope for a new life! Every $9 you give provides a hearty meal, a safe night’s rest, showers, clean clothing, restrooms and access to a wide range of resources to start their journey home. Give a birthday donation today. Come join us for the day! Bring yourself or a small group to help us run the event. We need volunteers for the birthday party from 12:45 p.m. – 4:30 p.m. AND volunteers for our dinner service from 5:30 p.m. – 7:15 p.m. Fill out an individual volunteer or group volunteer application.